Two years ago when the a 42 inch natural gass pipeline was installed running across some of my acreage, I had no idea I had a problem. In fact, I watched and watched that field hoping not to notice even a hint of standing water. And I didn't for a while. But you may remember that we've had three pretty wet seasons - last spring the crop was very late getting into the ground because of rain and we were even later getting it out of the ground because of rain. This year, the past couple of weeks have been filled with one downpour after another. All that rain revealed a tiling problem. And since the rain still isn't showing any signs of stopping, I've been two years trying to get it fixed. Finally, this month I was able to secure both the tiling company AND a dry enough day to get it done. We didn't figure this out until nearly the end of the process, but here is the problem. 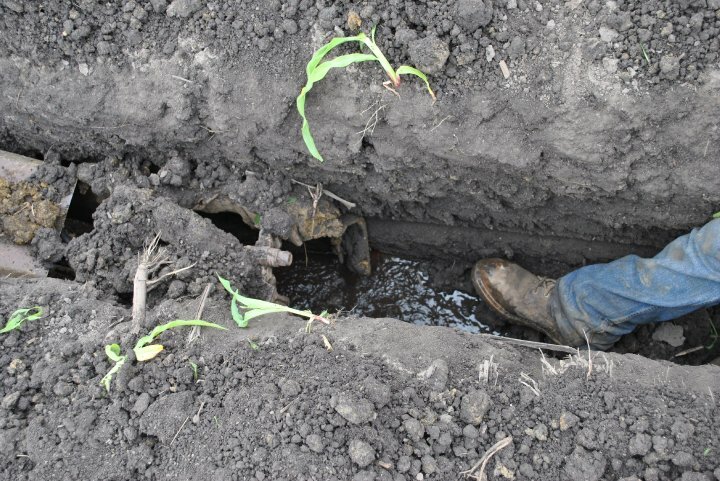 When the natural gas pipeline was installed, this section of older clay tile was broken and was not reconnected to the tiling system in this field. So we started in to fix it, essentially digging a trench that would hold the tile to drain water from the field. Next to fertilizer, tiling a field is one of the most profitable things you can do and will quickly earn you complete return on your investment. 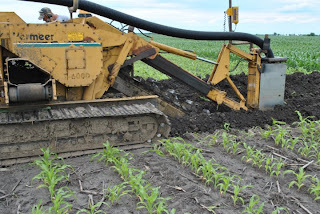 In fact, the absence of this particular section of tile yielded me two complete acres of drowned crops, five acres that were two wet to apply fertilizer, and reduced yield on about twenty acres surrounding it all because of excess moisture. We are installing five inch, black plastic tile because it is quicker and cheaper. The alternative is the clay tile that you saw in the picture above and it must be hand placed in the ground as opposed to the black plastic tile that comes on a large roll and just flows right into the trench that we dug. 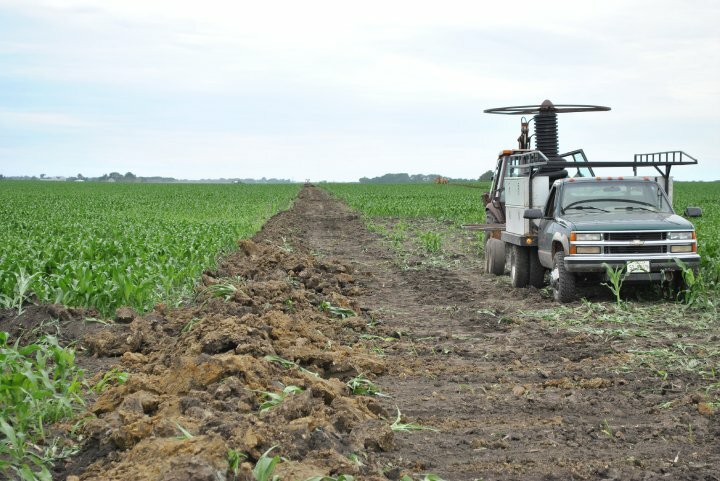 The tile is about three feet deep, and most tiles are set between 75 and 90 feet apart parallel throughout a field depending on soil type. In the end, this is what I have. 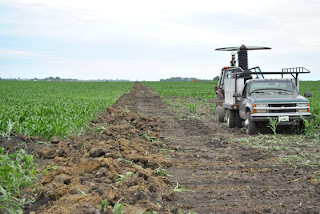 I lost a sixteen foot swath of emerging corn through my field that I won't be able to replace. 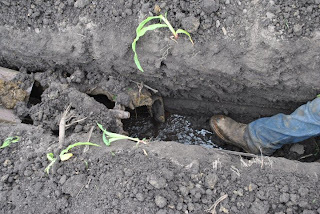 Typically, farmers don't tile in the middle of the growing season and disrupt their crops, but the losses I've sustained over the past two years made the timing this year necessary.